There are some pretty tough moments with little ones. Three-year-olds can be so charming one moment and so difficult the next. This is one of those moments where I felt like maybe something is going right in this little boy's upbringing. 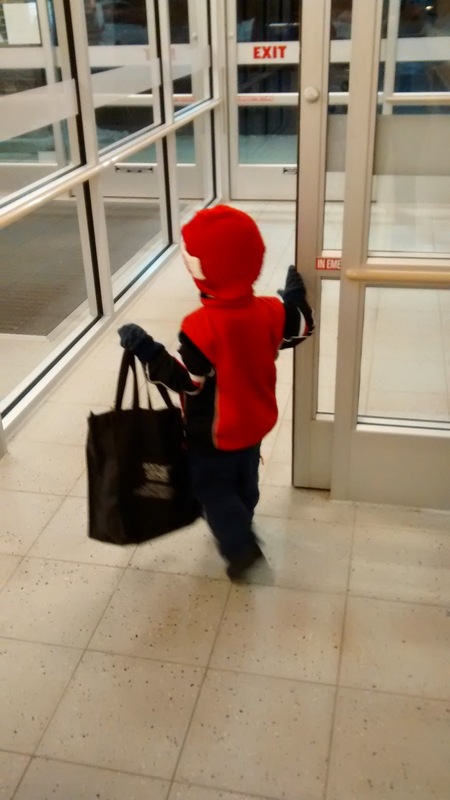 Big Bro A picked up this bag from the shelf all by himself and started off with it. Sure, we had a shopping cart; he didn't need to carry it. But his sweet little heart told him to help Mommy, and he did it all on his own. I love it. I'm grateful for a little man who is growing up into such a big helper. I actually love bringing him to the store with me for real now (versus when they're super little and it's really much faster and easier to go alone). He keeps me company, he helps me find things on the shelf, and he helps me carry the groceries. Well... unless he goes into an overtired tantrum. Oh, three-year-olds. Generally, though, bringing him with me brings me so much joy. I'm thankful for Big Brother A, my great little helper. We have a bed! ... Again!